The Ministry of Defence still faces big overspends, despite starting to bring procurement programmes under control, the National Audit Office has revealed. It said it was unclear whether a fall in cost overruns last year marked the start of a sustained improvement in the MoD's project management. 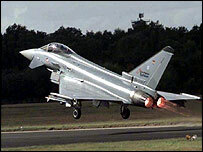 Defence procurement minister Lord Drayson said "progress" had been made. Earlier this week the MoD announced that it had made savings but was accused of putting spin on the figures. The accusations from the Conservatives came after the MoD took the unusual step of releasing figures showing forecast overruns on its 20 biggest projects fell by £699m during the 12 months to March. The revelation came just three days before the NAO published its annual report on the subject, prompting Tories to accuse the MoD of trying to pre-empt the NAO, which has been highly critical of its performance in the past. The NAO report said the cost reductions had largely been achieved as a result of reducing orders or downgrading equipment specifications. And, at the same time, overall delays had increased by another 45 months, according to the report. Sir John Bourn, head of the NAO, said that the fall in overall cost overruns - which still stand at a projected £2.7bn - was welcome. "The decrease in the forecast costs is a positive sign that the MoD is starting to bring its equipment programme under control," he said. "However, it is too early to judge whether this is the start of a sustained improvement in the MoD's project management." Meanwhile, Defence Procurement Minister Lord Drayson said: "Turning round defence procurement is not an overnight job, but this report shows the progress we are starting to make."